Dave Bailey served as a pilot during World War Two and was return to to working as a pilot in later years. After returning to civilian life he began to study drumming in New York and during this period he played with Johnny Hodges, Charles Mingus and Horace Silver among others. He is probably best known for his work with Gerry Mulligan and the Clark Terry / Bob Brookmeyer Quintet. He returned to flying and instructing other pilots in 1969 but returned to drumming and in 1973 he became active as a teacher and administrator and he was also the executive director of “Jazzmobile”. These are only a handful of albums under his own name and these two CDs contain three of them. 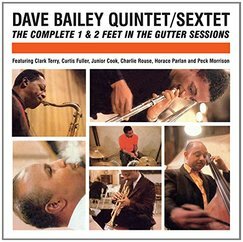 Dave Bailey has a long association with Clark Terry who plays trumpet and flugelhorn on the whole of disc one and the first track on disc two, he was composer of four of the numbers. On Horace Parlan’s composition “Blues for J. P.” all the front line soloists contribute hard swinging solos and are support each other by creating riffs behind each other which creates a certain amount of tension and release. For the final four numbers on the session Charlie Rouse is replaced by Junior Cook but there is no reduction in the quality of the music. On his “One Foot in the Gutter” Clark Terry contributes one of his solos that is full humour but is skilfully played and is followed by fine solos by Junior Cook and Curtis Fuller, Horace Parlan nearly steals the show with his best solo of the session. Another interesting track on the first disc is the almost twenty minute long Horace Parlan composition “Blues for J. P.” which has the finest Charlie Rouse solo spurred on by Fuller and Terry riffing behind him. Curtis Fuller’s intricate slide work on trombone is to be marvelled at and the composer’s punchy piano solo adds to the excitement. The final number on disc one and the first track on disc two are both Clifford Brown compositions and a welcome addition to this release. The next five numbers on disc two have a complete change of personnel and in comes trumpeter Bill Hardman who has a style in the Clifford Brown, Lee Morgan school. Tenor player Frank Haynes is a lesser known player but acquits himself rather well on these recordings. Pianist Billy Gardner is of the Red Garland persuasion and like Garland has a tendency to move into block chords during the second half of his solos which he does rather well but it becomes a little predictable when it occurs on every number. “Two Feet in the Gutter” is the most interesting track on the session with good solos by all concerned Bill Hardman is not present on the three final tracks and is replaced by guitarist Grant Green who plays well enough but the group does not have the same impact as the ones with Bill Hardman. For a drummer led group there is absence of drum solos but there is some supportive playing from the leader Dave Bailey. For it’s fine and interesting solos and the lack of drum solos this release is well worth a punt.